Since 2001, Albert Pujols rookie season, no one in baseball has hit more home runs. Alex Rodriguez (465), Adam Dunn (444), David Ortiz (415) and Alfonso Soriano (407) are the only others to have hit 400. 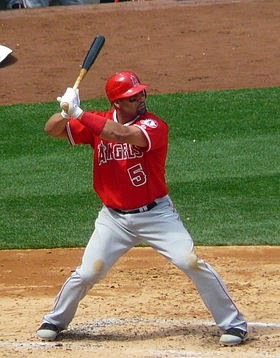 Pujols has homered against every team in the MLB, except his former club, the St. Louis Cardinals. We know Albert has been the best in baseball for a long time now, but to have hit the most home runs, and have the 3rd highest batting average since the 2001 season really tells you how dominant he has been. His .321 career average (7394 ABs) sits behind just Bonds (.325 in 2391 ABs) and Joe Mauer (.322 in 4456 ABs.). No pitcher has allowed more Pujols home runs than Ryan Dempster (8). Wade Miller is 2nd with 6. 7 other pitchers, including Randy Johnson, have allowed 5 home runs to Pujols. In total, he has homered off of 318 different Major League pitchers. His first home run came on April 6, 2001, off Armando Reynoso, in the top of the 4th. Albert has 10 career walk off home runs. Clearly Adam Dunn is next in line to hit 500 home runs, and will no doubt hit 54 more long ball in his career, barring any type of injury. Dunn's career began in 2001 as well and has drawn nearly 200 more walks than Pujols, but has 1400 more strikeouts! Dunn has 514 more strikeouts than the next guy, Soriano, since 2001. Alex Rodriguez has more home run than Dunn, but is suspended and has hit just 41 home runs over the last 3 seasons thanks to injuries. He is also turning 39 this year and been playing baseball since 1994. Giancarlo Stanton is leading the next generation of power hitters, and has hit his 123 career home runs at a similar pace that Pujols has hit his 500 career long balls, with a home run every 15 ABs. Since 1990, only 15 other MLB players have hit more home runs by the age of 25. Wilin Rosario is doing his best to be the best home run hitting catcher of his time. At the age of 25, Rosario has 55 career home runs in just 273 games played. Mike Piazza had 60 in 277 games played. Brian McCann (611 games played) had 91 and Ivan Rodriguez had 88 (880 GP) by the time they hit 25.